Prior to AIPAC speech, Republican frontrunner hints he would ask Israel to pay back the military assistance it receives from the States. 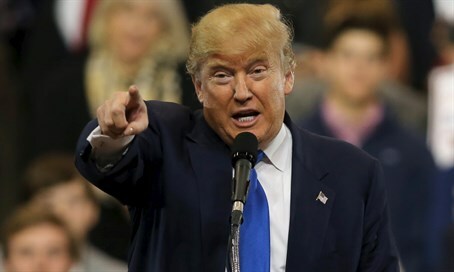 Republican presidential candidate Donald Trump hinted on Monday that, if elected president, he would force Israel to pay back the military assistance it has received from the United States. Trump, who was speaking to reporters prior to his speech at the AIPAC policy conference in Washington, DC, was asked whether past statements condemning countries who he said received defense aid from the United States should apply to Israel as well. “I think Israel will do that also, yeah, I think Israel do - there are many countries that can pay and they can pay big league,” he replied. The comments come amid negotiations between Jerusalem and Washington on a new military aid package, with the current package set to expire in 2018. Prime Minister Binyamin Netanyahu was recently urged to accept President Barack Obama’s 10-year military aid package which reportedly include a total of $145.8 million for Israeli missile defense programs, a sharp drop in financial support. A total of $3 billion in defense aid is given annually, but with those agreements expiring in 2018, Netanyahu has asked for an increase to $5 billion annually, in light of the greater need for security due to the growing Iranian threat after the nuclear deal.